"When He saw the crowds, He had compassion on them, because they were harassed and helpless, like sheep without a shepherd. Then He said to his disciples, "The harvest is plentiful but the workers are few. Ask the Lord of the harvest, therefore, to send out workers into His harvest field" (Matthew 9:36-38). "When He saw the crowds, He had compassion on them, because they were harassed and helpless, like sheep without a shepherd" (Matthew 9:36). "When He saw the crowds, He had compassion on them" (Matthew 9:36). "How do you know what your life will be like tomorrow? 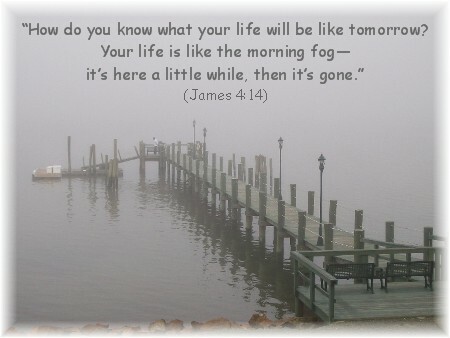 Your life is like the morning fog—it’s here a little while, then it’s gone" (James 4:14). "When Jesus saw this, He was indignant. He said to them, 'Let the little children come to me, and do not hinder them, for the kingdom of God belongs to such as these'" (Mark 10:14). "I tell you the truth, whatever you did for one of the least of these brothers of mine, you did for me" (Matthew 25:40). "At Caesarea there was a man named Cornelius, a centurion in what was known as the Italian Regiment" (Acts 10:1). "He (Christ) is before all things, and in Him all things hold together" (Colossians 1:17). "The Son is the radiance of God's glory and the exact representation of His being, sustaining all things by His powerful word" (Hebrews 1:3). "The priest replied, 'The sword of Goliath the Philistine, whom you killed in the Valley of Elah, is here; it is wrapped in a cloth behind the ephod. If you want it, take it; there is no sword here but that one.' David said, 'There is none like it; give it to me'" (1 Samuel 21:9). "A man was there by the name of Zacchaeus; he was a chief tax collector and was wealthy. He wanted to see who Jesus was, but being a short man he could not, because of the crowd. So he ran ahead and climbed a sycamore-fig tree to see him, since Jesus was coming that way" (Luke 19:2-4). "O give thanks to the Lord of lords: for His mercy endures forever" (Psalm 136:3). "There is no one holy like the LORD; there is no one besides you; there is no Rock like our God" (1 Samuel 2:2). "We are asking God that you may be filled with wisdom and that you may understand its purpose. We also pray that your outward lives, which men see, may bring credit to your Master's Name, and that you may bring joy to His heart by bearing genuine Christian fruit in all that you do, and that your knowledge of God may grow yet deeper. We pray that you will be strengthened from God's glorious power, so that you may be able to pass through any experience and endure it with joy" (Colossians 1:9-11 Phillips translation). "He chose to be mistreated along with the people of God rather than to enjoy the pleasures of sin for a short time" (Hebrews 11:25). "Jesus looked at them and said, 'With man this is impossible, but with God all things are possible'" (Matthew 19:26). "He sits enthroned above the circle of the earth, and its people are like grasshoppers. He stretches out the heavens like a canopy, and spreads them out like a tent to live in" (Isaiah 40:22). "Your labor in the Lord is not in vain" (1 Corinthians 15:58).